"Yes in a dream all my teeth fell out, A cracked smile and a silent shout"
The Dave Brubeck Quartet "Time Out" LP Side1. V/G- Side 2 V/G. CL 1397. Mono. 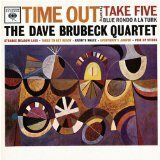 Time Out is ranked as the best album by The Dave Brubeck Quartet. Members who like this album also like: Kind Of Blue by Miles Davis, Mingus Ah Um by Charles Mingus and The Black Saint And The Sinner Lady by Charles Mingus. Related links: top tracks by The Dave Brubeck Quartettop tracks of the 1950s, top tracks of 1959. Showing latest 5 ratings for this album. | Show all 526 ratings for this album. Related links: top albums of the 1950s, top albums of 1959. A fusion of jazz and arithmetic. Abstract but solid, fast but accurate. Amazingly perfect in every aspect. It's everything you need from a jazz album. Great jazz album, and this is coming from someone who doesnt listen to a lot of jazz. Miles and Coltrane mostly, but this is a jazz album that if introducing someone to it, would recommend. Very listenable the first time. Very nice album of the day surprise. 1959 was the greatest year in jazz history, and Time Out is one the year's best albums. Dave Brubeck combined cool jazz with odd time signatures to examine one of jazz music's core tenets, and show that jazz does not need to strictly be played in 4/4 or march time. Exploring 3s, 5s, 9s and other uncommon groupings, Brubeck not only showed that jazz was not a one trick pony, he also made one of the coolest jazz albums of all time. The album is not just noted for its experimentation, but for its quality as well. Although its most known for Take Five, Blue Rondo al la Turk and Kathys Waltz are also incredible tracks, while the remaining tracks are good to great. Essential listening for fans of jazz, and a great place to start for those wishing to expand their understanding of music. One of the greatest jazz LP's ever. Time out, is a lovely record and totally accessible to people who don't normally listen to jazz. It's a perfect late night album, like all jazz albums should be, and features some timeless tracks. Blue rondo, and, take five, are amazing. Great album from the great Dave Brubeck. Very good album. Take Five is an all-time classic and what this album is probably known for by most, but Blue Rondo À La Turk is even better in my opinion. The rest of the album is good yet unmemorable, other then Strange Meadow Lurk and Kathy's Waltz which stand out a little bit. Nothing defines cool like this record. Innovative, assessable and challenging it stands in a class by itself. A unique album, one of its kind, like "Sketches of Spain". Both innovative and accessible.